Hansis Kiste war das erste Mal ‘on show’. – Bilder hier. Zum Saisonabschluss 2013 hatte der A33 S.C. geladen. Dieses Jahr fand die Party in der Jetsons Werkstatt statt. Danke noch mal an Ted & Urte für die Organisation und den A33 für Bier und Grillage. While it’s the off season in Europe, here on the West Coast of the US we’re enjoying 70 degree sunshine and are happily polishing up 2013’s projects. After some side tracking (a GT550 and an RD350 came along) this project has finally seen its completion (well, nearly). 5 speed gearbox, Supermonza kit, and a slew of other goodies that I had pieced together over the years all amount to a quite ridable and reliable super fast bike. Click here to see the whole article. Years of scouring sometimes yield unexpected results. 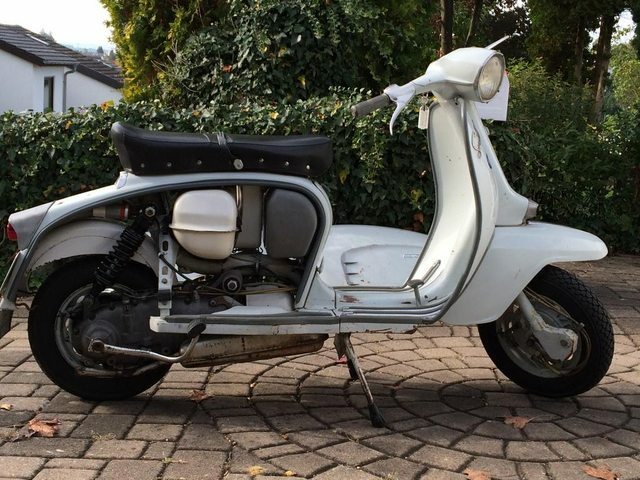 Like this running condition SX150 that just needed a bit of work to get going. Loving it!